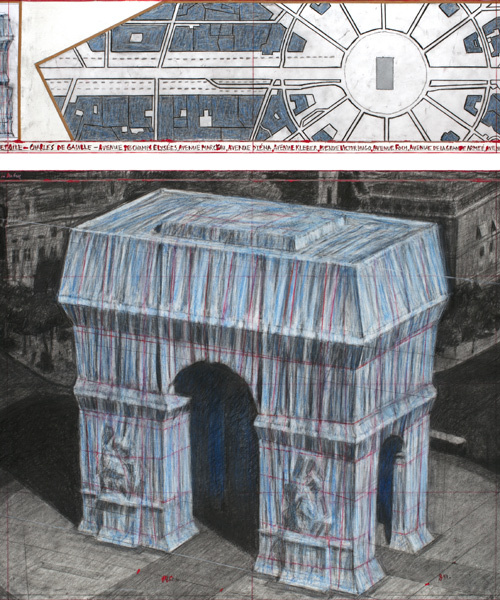 christo has unveiled plans to wrap the arc de triomphe in paris in 25,000 square meters of silvery blue polypropylene fabric. 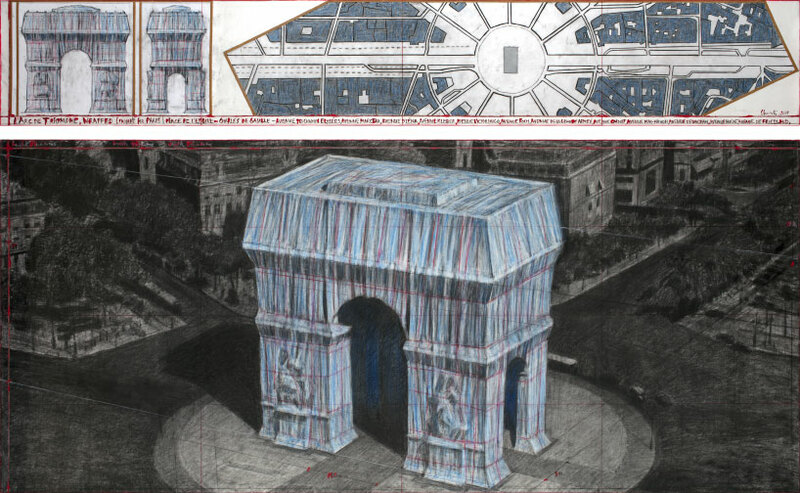 the temporary public artwork, entitled ‘l’arc de triomphe, wrapped (project for paris, place de l’étoile-charles de gaulle),’ will remain on view for two weeks, from monday, april 6, to sunday, april 19, 2020. the fabric, which will be fully recyclable, will be held in place by 7,000 meters of red rope. 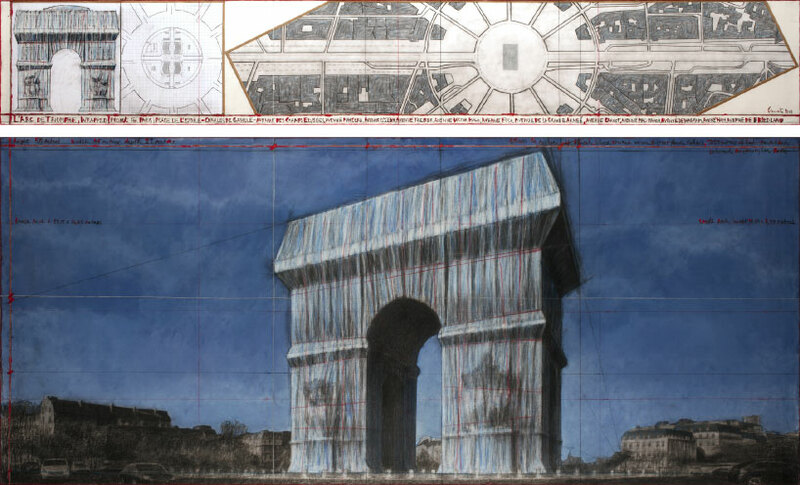 ’35 years after jeanne-claude and I wrapped the pont-neuf, I am eager to work in paris again to realize our project for the arc de triomphe,’ says christo. 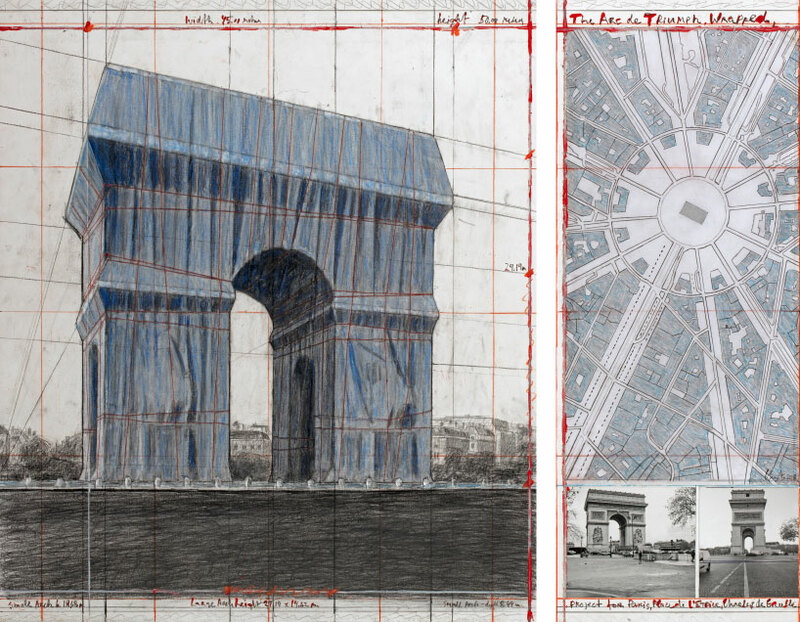 in 1961, three years after christo met jeanne-claude — his life and artistic partner who passed away in 2009 — the couple began creating works of art in public spaces. one of their projects was to wrap a public building. 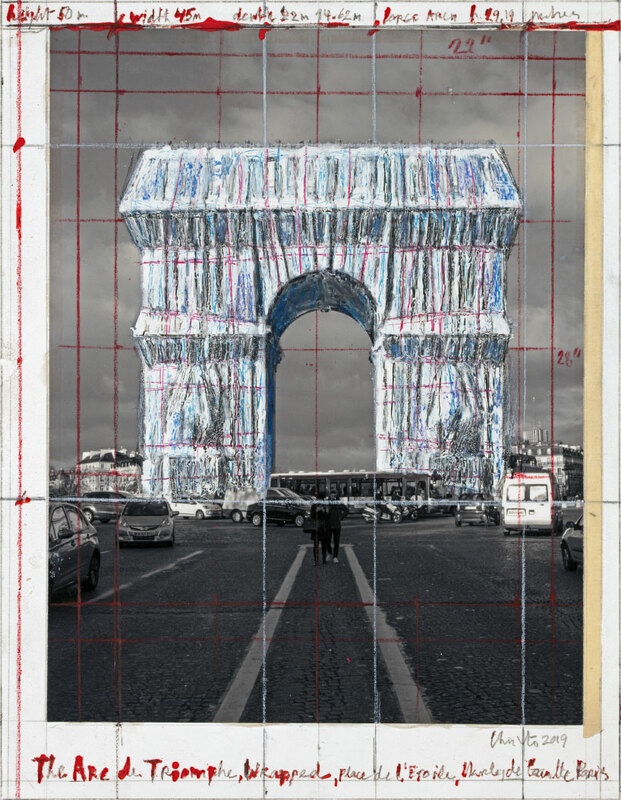 at the time, christo, who was renting a small room near the arc de triomphe, made several studies of a project there, including, in 1962, a photomontage of the arc de triomphe wrapped. almost 60 years later, the project will finally be realized. 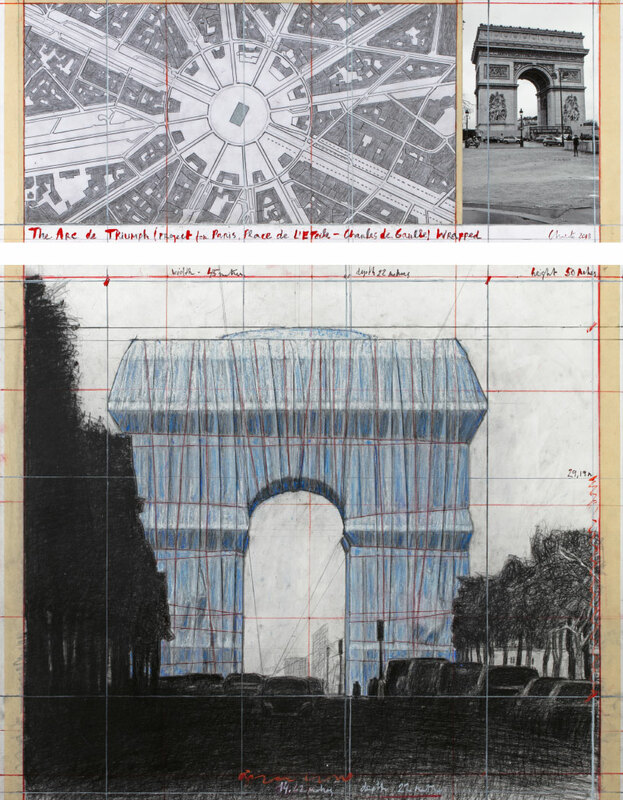 as with all of christo’s projects, ‘l’arc de triomphe, wrapped’ will be entirely funded by the artist through the sale of his preparatory studies, drawings and collages of the project as well as scale models, works from the 1950s and 1960s and original lithographs on other subjects. it will receive no public or private funds. What B.S. Recyclable? Not WILL be recycled. And how much energy and waste goes into these ego-driven projects? After a day or two of gee-whiz factor, this will create an unconscionable pile of plastic waste. Just what our society needs. 25,000 square meters of silver blue polypropylene fabric. A project of this kind must have some impact on the environment! Let’s see … This amount of fabric can dress 50,000 people visiting Paris during the exhibition, supposedly already sensitized on the subject. He has been obsessed with wrapping for his entire career. First he began with smaller object. I think this obsession coins with this massive global capitalism that’s threatening the entire planet. He also curtains. Even the horizon. 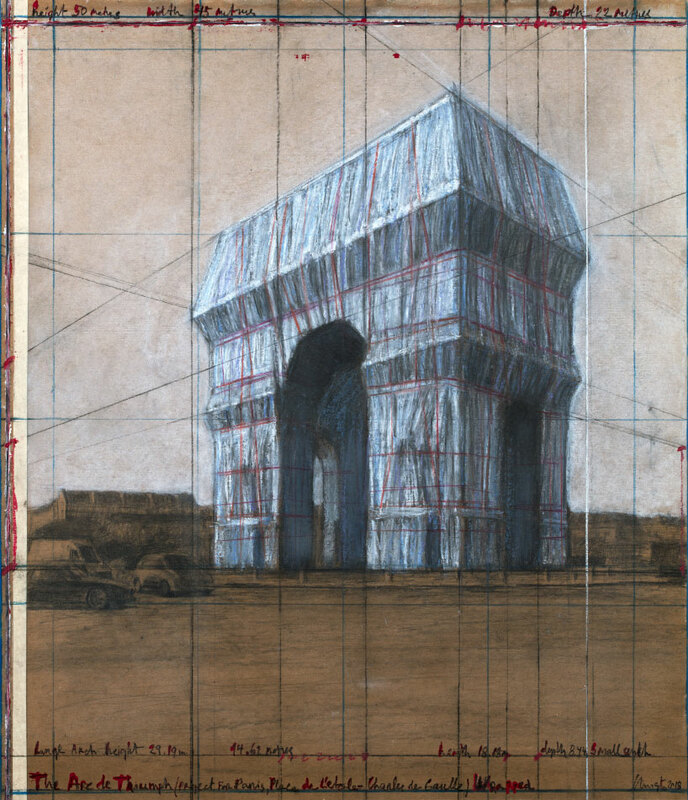 His work make me claustrophotic. Take down the curtains!!! I need my horizon to breathe.